VETCARE Veterinary mission is to provide responsive and quality information technology services to protect and improve the health, quality, and marketability of your pet. The annual checkup can be performed when an animal is in good health and is not currently undergoing any course of treatment. By conducting the study when there are no apparent problems, your vet can create a healthy animal profile, aiding in future diagnosis. Even more importantly, this method can detect hidden diseases that can endanger your pet. It also provides a great opportunity to check that your pet is up to date with their vaccinations and deworming tablets. An annual checkup may seem too often but our pets age faster than we do. For a dog to survive one year without a visit to the vet is the equivalent to man not seeing his doctor for 10 years! For cats one year without a visit to the vet is roughly equivalent to five years of human life! Through regular yearly examination your veterinarian is able to detect and prevent many dangerous diseases and afflictions. The annual checkup is key to being a responsible owner and ensuring your pets enjoy a longer and healthier life. Intestinal worms, such as roundworm and tapeworm, are a common problem in dogs and cats. The problems of worms are twofold: the health consequences for your pet and the chance of transmission to humans. An animal infected with worms will secrete the worm’s eggs in its feces and they can be easily transferred onto the animal’s fur, clothes, bedding etc. If ingested, these eggs will hatch and become adult worms in your gut. Roundworms and tapeworms can cause diarrhea, weight loss, vomiting and a dull coat in dogs and cats, but the health consequences in humans can be more severe. These symptoms can be present in humans but additionally the worms can migrate to other organs and lead to serious health consequences, however, this is extremely rare. To prevent/treat intestinal worms, it is important to deworm your pet every 3 months. Deworming tablets are available from the clinic over the counter. It is important to note that in many cases, animals show no symptoms when infected with intestinal worms so it is crucial you deworm your pet even if they appear perfectly healthy. Every pet you take home should be vaccinated for a few potentially life-threatening diseases. Because most vaccines destroy natural antibodies derived from mother's milk, the first vaccination should take place only after weaning puppies/kittens from their mother (about 8 weeks of age). For the first vaccination, kittens are vaccinated against cat flu, feline parvovirus and feline panleucopenia, and puppies are vaccinated against canine distemper, parvovirus, hepatitis, parainfluenza and leptospirosis. At 12 weeks of age, they have their second vaccinations where they are given boosters for the previous vaccinations plus their first rabies vaccination. These vaccines provide protection for your pet for 12 months and thus require an annual booster. In Dubai, you MUST vaccinate your pets and ensure their annual boosters are kept up to date by law. Some diseases that affect your pet can also affect you (zoonotic diseases). Canine Leptospirosis, for example, is an illness that can be transferred to humans and has the potential to cause serious health issues whereas rabies can lead to death. It is therefore crucial, not just for your pet’s health but for the health of you and your family, that you vaccinate your animals. If you are planning on enrolling your dog in group training classes, boarding them at a kennels or cattery or taking them to doggie daycare, they should have an additional vaccination against kennel cough at least 2 weeks before the event. They should then receive boosters alongside their annual vaccinations. TICKS are blood drinking external parasites that attack warm-blooded animals including dogs, cats and humans. They usually come in two forms: tiny black flat circles (males) and bean-sized grey spheres (females) A tick itself usually causes very little damage beyond slight skin damage or allergies, however, in some cases it can cause a condition called tick paralysis. This occurs when the tick attaches close to the spinal cord causing muscle paralysis/weakness and can lead to death due to paralysis of the chest muscles leading to respiratory failure. The real danger, however, lies in the diseases that ticks often carry such as Babesia, Borrelia and Ehrlichia. These diseases can cause serious health complications and can even lead to the death of your pet. Due to the hot climate, Dubai is a hotspot for ticks throughout the year thus it is important that you regularly treat your pet for them. A spot-on treatment, such as Frontline, once a month is recommended by our clinic. Applied to the skin at the back of your pet’s neck, the liquid stores itself in the oil glands at the base of hair follicles and self-distributes continuously for one month to kill ticks as soon as they come into contact with your pet’s coat. It is a highly effective preventative and curative treatment for ticks that is so easy to apply that you can do it yourself! FLEAS are another type of blood-sucking external parasites. They are tiny wingless jumping insects whose saliva causes skin irritation but they can also carry dangerous diseases. Fleas are not a large concern in the UAE, however, the Frontline product used for ticks is also effective against fleas. Periodontal disease, which causes redness, swelling and irritation of gums, bleeding gums, bad breath, receding gums and tooth loss, is on the rise in household pets. Due to improved nutrition and healthcare pets are living far longer than their wild counterparts and thus retain their teeth for longer. To prevent periodontal disease affecting your pet later in life, it is essential that you look after their oral health. Your veterinary surgeon will exam your pet’s teeth during their annual checkup to determine the level of tartar buildup and the condition of their gums. If the tartar level is high, teeth descaling is recommended. This is a procedure performed under general anesthesia where the tartar buildup is removed using an ultrasonic scaler followed by dental polishing . The length of time between teeth descaling can be extended if you brush your pet’s teeth. Just like humans, brushing prevents the formation of tartar and promotes healthy teeth and gums. Special pet toothbrushes and toothpastes are available at our clinic, along with advice on how to get your pets to cooperate! Although time consuming, by routinely brushing your pet’s teeth you greatly improve their oral health and reduce the need for regular teeth descaling. Vetcare veterinary surgeons perform a range of surgical procedures from routine surgeries, spays, neutering, soft tissue tumor removal, gastrointestinal and other abdominal procedures on accompanying pet animals. We are also fully equipped with orthopedic equipment allowing us to carry out complicated orthopedic surgeries, fractures, knee operations and others. Electronic identification plays an important role in returning lost animals to their owners and in tackling illicit trafficking and theft. A microchip provides a solid and unique form of identification that cannot be lost overtime and leaves no visible trace on the animal. A small capsule the size of a grain of rice with a coded identification number is injected under the skin in a simple painless procedure. The whole procedure takes less than 5 seconds and is performed using a needle only slightly larger than those used for vaccination. The animal can then be scanned using a special microchip scanner that will detect the chip and display its unique identification number. The microchip itself contains no information about the owner or animal, just the identification code. When a microchip is implanted, the details of both pet and owner are entered into an official database alongside the identification code. This means if an animal is found and scanned, the identification number can be used to search the database to find the owner’s details. Grooming can also be combined with teeth descaling, recommended if your pet needs to be sedated for grooming as both procedures can be done under one round of anesthetic rather than two, reducing the risks involved. A municipality tag is a disc that attaches to your pet’s collar and is required by law in Dubai for dogs and cats. Every year after your pet has had their annual checkup and received their vaccinations; they will receive a municipality tag from our clinic. The clinic then sends your pet’s tag number, their details and your details to the Dubai Municipality Veterinary Department. This means if your pet is ever lost and brought to the Municipality, they can trace your pet back to you. It also prevents the Municipality from mistaking your pet at as a stray. If your pet loses their tag it must be replaced and re-registered. Replacement tags are available from our clinic. It is a unique municipality number assigned to your pet. Under that number the animal and the owner are registered with the Dubai Municipality Veterinary section. The Municipality tags are replaced every year when the animal is been vaccinated. To obtain such a tag the animal must be vaccinated and microchiped. In cases like (loosing your pet, or if the animal was found) anybody can ring the municipality clinic and obtain details about the owner, his address, telephone number etc. If the animal is vaccinated and microchip he can buy such a tag in the clinic. You need to bring your vaccination card along with you. American Staffordshire Terrier, American Pit Bull Terrier, American Bull Dog, Bull Terrier, Old English Bull Dog, Staffordshire Bull Terrier, Tosa, Husky, Doberman, Shar Pei, Perro de presa mallorquin/ Bull Dog, Neapolitan, Argentinean Mastiff, Miniature Bull Terrier, Canary dog fila Brazilerio/ Brazilian Mastiff. However this may apply to people living in flats or apartments. According to, Head of Veterinary Section in the municipality, the banned breeds “are the ones that are not suitable to be raised in apartments. They pose grave danger to children and other people residing in the apartment”. People are allowed to keep such dogs in residential villas and farmhouses but they must be muzzled and leashed at all times when taken outside. MUNICIPALITY FINES- will sent or check if not previously sent. Diagnostic tests play a crucial role in the diagnosis of your pet. Animals are able to completely hide their pain for a longer period of time and thus risk late diagnosis, which can serious affect their prognosis - there may not be time for effective treatment. Diagnostic testing allows us to see what is going on underneath the surface that your pet can’t tell us. Our laboratory is equipped with a wide range of machines that provide results within 10 minutes to 1 hour maximum. 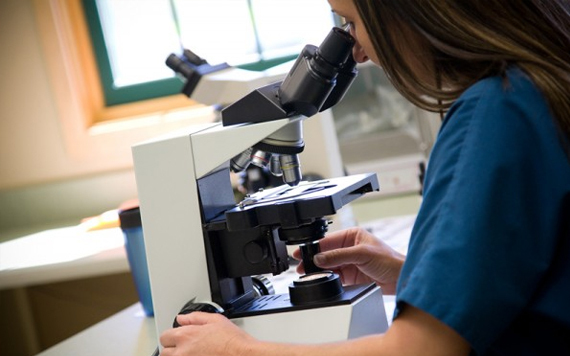 We are equipped with Idexx Laboratory Suite machines table to perform routine blood tests, which are a good indicator of an animal’s basic health and are used in the diagnosis of many diseases. In older patients blood tests can be performed once a year to monitor their condition and ensure early detection of many senile diseases. An ultrasound machine is available to determine pregnancy, diagnose conditions such as pyometra, and identify internal organ irregularities including tumors and free fluid accumulation in the body cavities. We have equipment and tests including microscopes to enable fast diagnosis of external parasites commonly seen here (mange, scabies, lice). Other technology including an ECG, laser knife, Vet Drop, endoscopes (rigid and flexible) and X-Ray facilities (full body and dental) are also available if required. The Vetcare surgery ward is equipped with the latest equipment necessary to provide your pet with the highest standard of safety during any surgical procedure. Our patient monitoring system includes a SpO2 /capnometer, surgical ecg and blood pressure monitor, which helps us to maintain good monitoring protocols during surgical procedures. The use of electro surgery knife and latest Diode Laser knife are allowing us to minimize blood loss and encourage faster healing. In the coming month we will start our Pet Rehabilitation Centre that will ensure proper rehabilitation of post orthopedic patients and other patients suffering from degenerative diseases and locomotive problems. 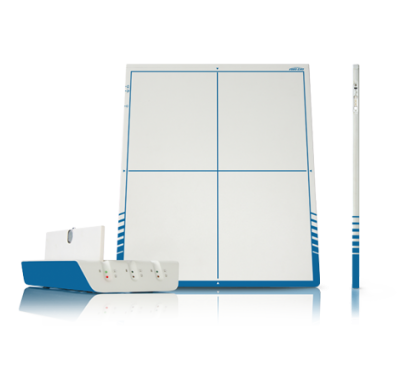 We will use magnetic muscle stimulation blankets, laser rehabilitation techniques and the latest Vet Drop machine for per cutaneous medicine application without using the traditional needle technique. Please watch our website for details on the launch of the rehabilitation Centre. VetDrop® is a newly developed application method for effective, topical therapy and prophylaxis for animals. The completely newly developed micro-application process, which is protected by various patents, transports highly effective substances through the skin exactly to the location of the problem and gently allows an optimal concentration of the active agent where it is required - without any strain on the entire organism. Therefore, VetDrop® is an intensive, highly effective treatment for lameness, tendon injuries, skin, hoof and joint disorders. 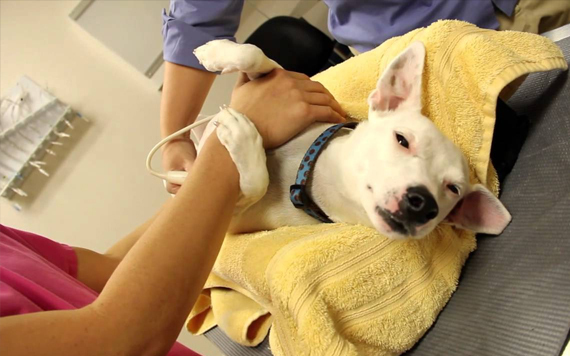 We perform VetDrop® microapplications inpatient and out-patient. Vetcare is fully equipped with an IDEXX Vet Lab Station allowing us to run many routine tests. We also cooperate with the biggest and most recognized lab in the UK called Idexx, giving us the opportunity to run various specialist tests not currently available in the Middle East. Vetcare uses the latest Fuji Computer Radiography machine to perform radiography on your pet. Some of the dental procedures require additional visualization of the condition of the tooth/teeth which is not possible with traditional x-ray machines. Vetcare has a portable dental digital radio graph machine the size of a regular camera to allow the vet to take x-ray of any of your pet’s teeth and decide on the further treatment required. We are also equipped with 2 ultrasound machines with Doppler, which allow us to perform ultrasound diagnostic imaging for your pet. 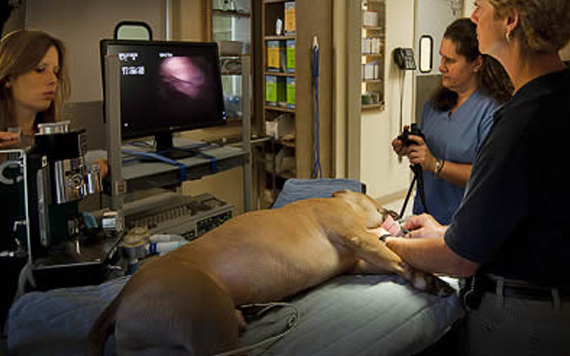 We are equipped with both rigid and flexible endoscopy devices allowing us to remove foreign bodies from the animal esophagus or stomach, or do routine endoscopy, gastroscopy and colonoscopy on your pet with the capacity to take biopsies also. We are the only veterinary clinic in Dubai currently using fluoroscope, which is a useful device used during orthopedic procedures on animals to guide the placement of metal frameworks and plates. Equine radiography is an imaging modality that is still an essential component of a horse's orthopaedic diagnostic evaluation. It is made possible by the production of useful, high-energy photons (x-rays) that pass through the area of interest and are used in the production of the resultant image on the specially sensitized film screen. Our powerful system provides excellent quality images of nearly all parts of the horse, including areas, such as the back or the shoulder, that are difficult or not possible to image with portable machines. Oblique view showing the caudal thoracic vertebral body and articular process joints of a horse. There is thickening of the subchondral bone plate of the articular process joint between the 15th and 16th thoracic vertebra (black arrows) and enlargement and particular new bone formation around the articular process joint of a horse between the 16th and 17th thoracic vertebra (arrowheads). There is marked ventral spondylosis between the vertebral body of the 12th and 13th thoracic vertebra. Dental x-rays, or radiography, has greatly enhanced the way we, as veterinarians, practice veterinary dentistry. So much of dental disease, such as periodontal disease, tooth root abscesses, jaw fractures, tumors, etc., occurs below the gum-line, that dental radiography is an absolute necessity to practice veterinary dentistry. Dental radiography allows for diagnosis of certain diseases, plan for the appropriate treatment as well as monitoring for treatment success. The relatively recent introduction of digital radiography has further advanced this diagnostic tool. Digital radiography has the advantages over conventional film radiography in that it uses approximately 1/3 of x-radiation to create the image, the ability to enlarge the image to see small changes, increase or decrease contrast to help small lesions show up better, archival of images on a hard drive or back-up disc, easy retrieval, and the ability to print the images for client education. Digital radiography are also quicker to take and develop. Usually a radiography of an area can be “developed” within 5-7 seconds, where dental film radiography take generally one minute each. Digital radiography have the added advantage of being easily e-mailed if needed for referral or communication with referring veterinarians. 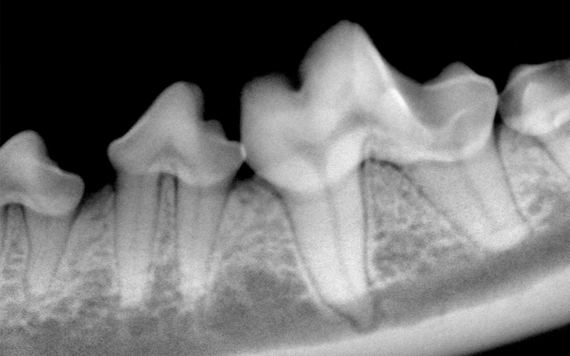 Conventional dental film radiography have the advantage of better resolution and can serve to evaluate larger areas than can be done by digital at this time. Abdominal ultrasound is an extremely useful tool for diagnosing a variety of diseases including (but not limited to) bladder stones, kidney disease, gastrointestinal obstructions, liver and splenic disease, pancreatitis, bleeding, and tumors. Many diagnoses that we can make by a non-invasive ultrasound exam previously required exploratory surgeries. Ultrasound is a great way to check for pregnancy in dogs and can usually be performed about 4 weeks after breeding. We routinely performs echocardiograms (ultrasound of the heart) on pets with heart disease. This is an invaluable tool in the diagnosis and treatment of heart disease in dogs and cats. Ultrasound allows us to examine the internal structure and patterns of blood flow within the heart itself. Ultrasound can determine if it is just a mild leaking valve or a life threatening heart dilation. Endoscopy allows a visual examination of internal organs and body parts without invasive exploratory surgery. It was first described in the early 1800's, but it was not until the late 1800's that optical lenses were developed which could be used in viewing devices and endoscopy could start to be used. 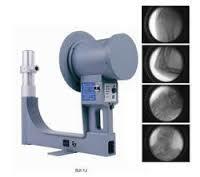 Endoscopy is performed with either a rigid or flexible fiberoptic instrument. Flexible endoscopes such as those used in the examination of the stomach consist of a long, flexible insertion tube with a bending tip at the end that enters the body, an eyepiece, and a control section. The tip of the endoscope is manipulated using a control knob in the hand piece. In addition to the fiber bundles which provide the light source, two channels are present within the endoscope. One channel permits various endoscopic tools to be passed and fluids to be suctioned or samples taken. The other allows air or water to be passed into the stomach/intestine to insufflate (inject air into the area), or wash away mucus from the viewing port. Special video cameras can be attached to the endoscopes which allow viewing of the exam on a television screen, as well as recording the exam on video. The rigid endoscope cannot be used in some areas, such as the stomach because it does not have the bending tip, so it cannot be flexed to allow examination of all parts of the stomach. Fluoroscopy is a non-invasive procedure which uses x-rays to help capture and monitor video images of specific parts of the body while they are in motion. Animal Imaging’s new radiology suite uses fluoroscopy for flow studies using barium contrast, myelograms, and for studies where changes over time are important –as with collapsing tracheas. Organic iodine contrasting agents are used for special vascular urine flow studies. Fluoroscopy facilitates the placement of tracheal stents. These expanding Nitinol stents are helpful in managing select collapsing trachea cases.